YUM! I have a love affair going on with this herb crusted chicken recipe. Not only does the chicken look fabulous on a plate, but it is also super moist, full of flavor from a special herb mix and really tender. 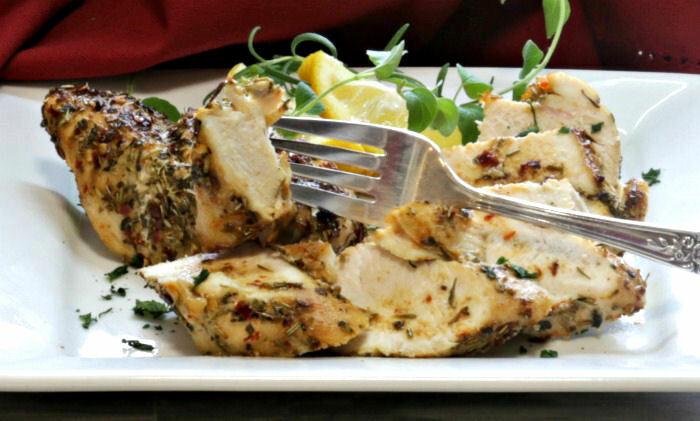 There is nothing quite like chicken breasts, baked in the oven with a herb seasoning rub. I start by browning the chicken slightly on the stove top and then placing them in an oven proof baking dish for the rest of the cooking time. This recipe gives me tender, perfectly seasoned chicken every time in just 30 minutes and is Whole30 compliant. Have you noticed the size of chicken breasts lately? The last batch that I bought weighed in at about 11 ounces each. I had to actually trim them to get the size I wanted for this recipe. I love baked chicken, but 11 ounces is a mouthful for even the hungriest foodie! The good news is that breasts this size are usually much thicker which means they will be more tender and won’t dry out in the oven! Since I am trying to lose a bit of weight lately, I chose to go with no skin or bones. Don’t worry. You’ll still have a ton of flavor. The special garlic herb spice rub will make sure of that! I also pan cooked the chicken on the stove top first to give it a good color before placing it in the oven and to bake to make sure it seared in the moisture. The rub is made from equal parts garlic powder, rosemary, red pepper flakes, sea salt, thyme and oregano. 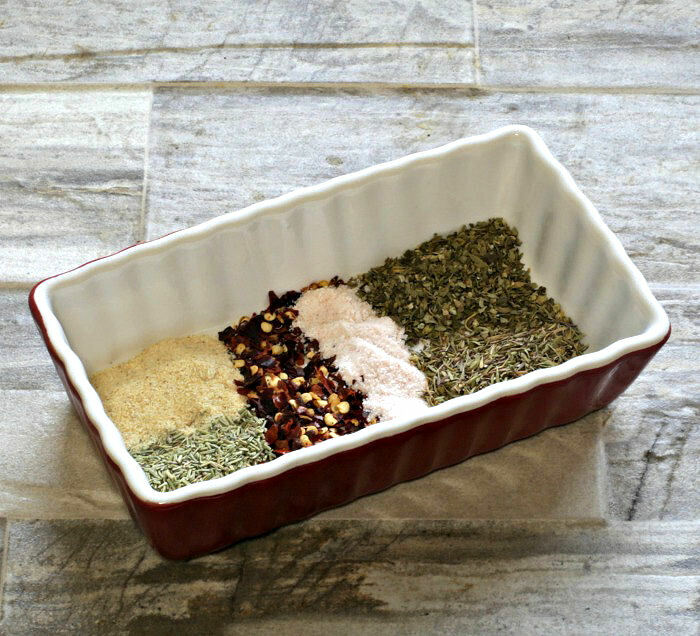 It adds a really robust flavor to the herb baked chicken with just a touch of heat. You can go less on the red pepper if you are not so fond of heat. 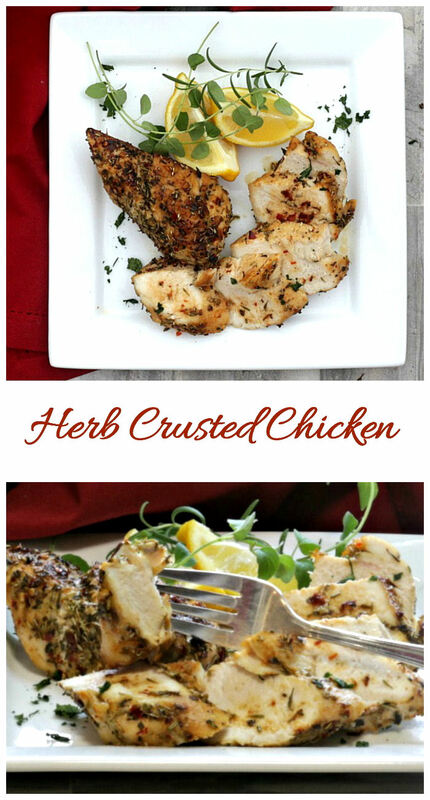 This herb crusted chicken recipe is ready in just 30 minutes! 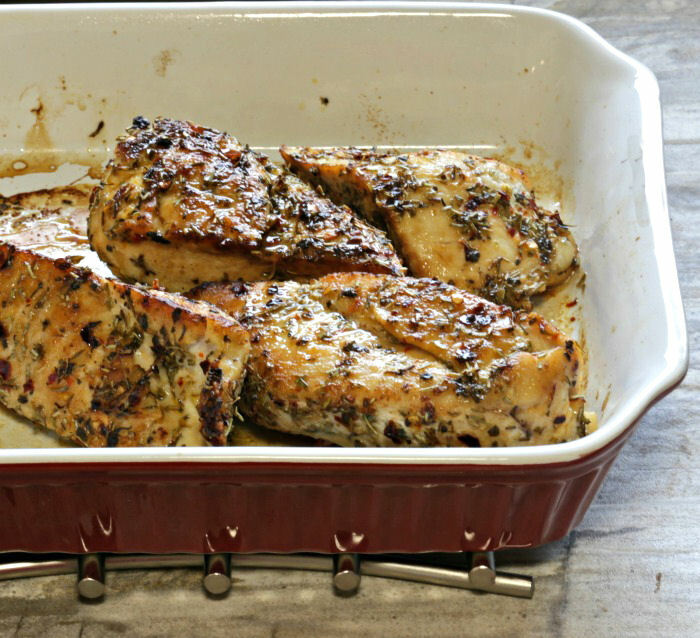 My baked herb chicken recipe is as easy as they come. Start by combining the spice rub in a bowl, and rub it over the chicken breasts. Be sure to coat the chicken on both sides to ensure maximum flavor. What could be easier than that? Next, I heated a tablespoon of olive oil Just pop it in the oven about 2-3 minutes on each side. Doing this will not only give the chicken a lovely golden brown color, it will also sear in the juices which will keep the chicken tender when you transfer it to the oven to finish baking. Transfer the seared chicken to an oven proof baking dish and bake for 25 minutes, checking the chicken with a cooking thermometer after 20 minutes. You can also just put the saute pan in the oven if it is oven proof and you are not worried about a pretty display on the table later. The internal temperature should be 165 º F in the thickest part of the chicken. Testing with a meat thermometer is the only sure fire way to make sure it is done. Don’t you just love the golden brown color? Those spicy bits are beckoning me with a promise of a really tasty flavor. Can’t wait to dig in! 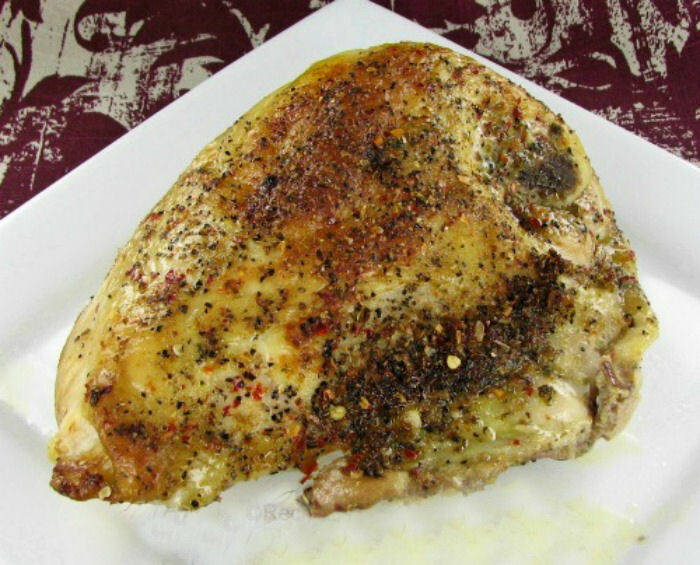 This herb baked chicken breast is so moist and tender. 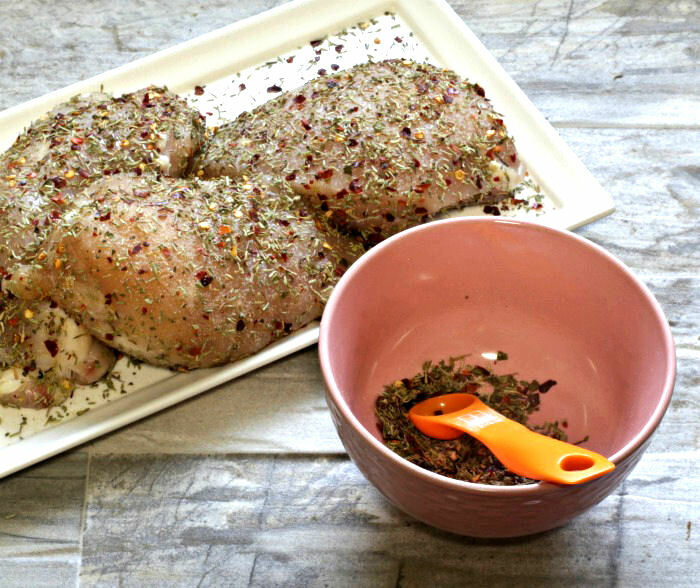 The special herb blend gives the outer part of the chicken such flavor. You won’t believe there is no skin! The taste is robust and makes you feel as though it has been grilled on a charcoal grill, even though that is not the case. Spice rubs are amazing that way. They can turn an ordinary bland piece of chicken into something really special. The flavor is quite spicy if you use the higher amount of red pepper flakes. My husband loves spicy food, so I did, but you may want to use just 1/4 tsp of red pepper if you are not so fond of spicy food. Fresh herbs make a wonderful garnish. I used fresh oregano and thyme to give a bit of color and fresh taste, and also drizzled over a little fresh lemon juice to give the chicken a slight citrus flavor that complements the herbs. Add a tossed salad or a side dish (my roasted carrots and mushrooms with thyme is great with this chicken recipe) and you have a meal that is Whole30 compliant, Paleo and Gluten free. Each breast has only 209 calories, which makes it perfect for those who are watching their weight. It is also high protein, low carb, and low in saturated fat. A win win in all the nutritional areas. 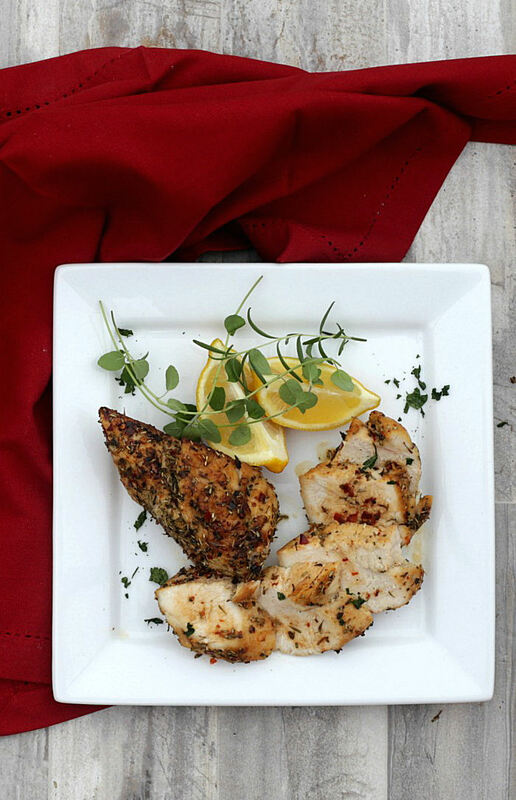 This garlic herb crusted chicken is perfect for any busy weeknight, but still pretty enough to serve at a fancy dinner party. Look at that color on the crust, contrasting to the luscious tender chicken meat! 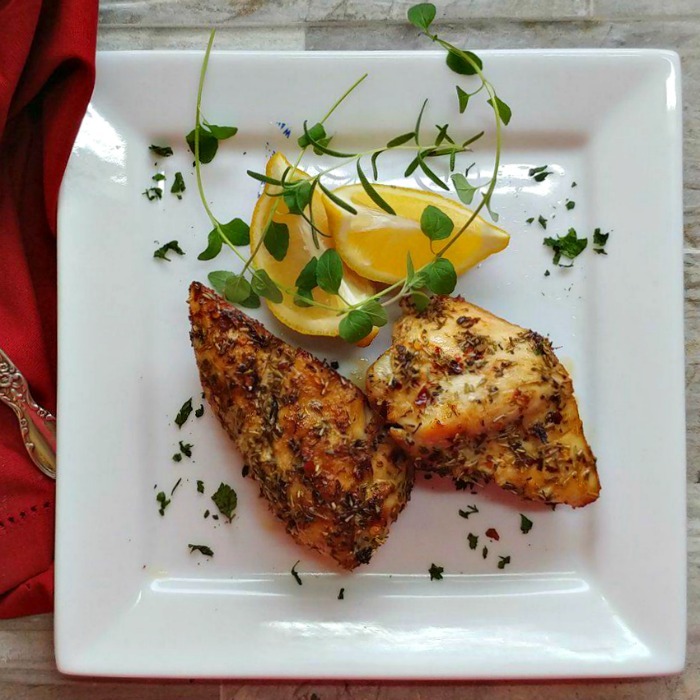 You can make this herb crusted recipe with either boneless, skinless breasts, like I did today, or opt for breasts with skin and bone in. Either way works great. If you use bone in chicken with skin, cook it for about 40 minutes and note that it will add extra calories. Admin note: this recipe first appeared on the blog in March of 2014. I have updated the post with new photos, as well as adapted it for both bone in and boneless chicken. I have also added the nutritional information. Enjoy! Combine the spices together and rub the mixture over both sides of the chicken breasts. Heat the olive oil in a pan over medium heat and cook the chicken for 2-3 minutes on each side until it is nicely browned. 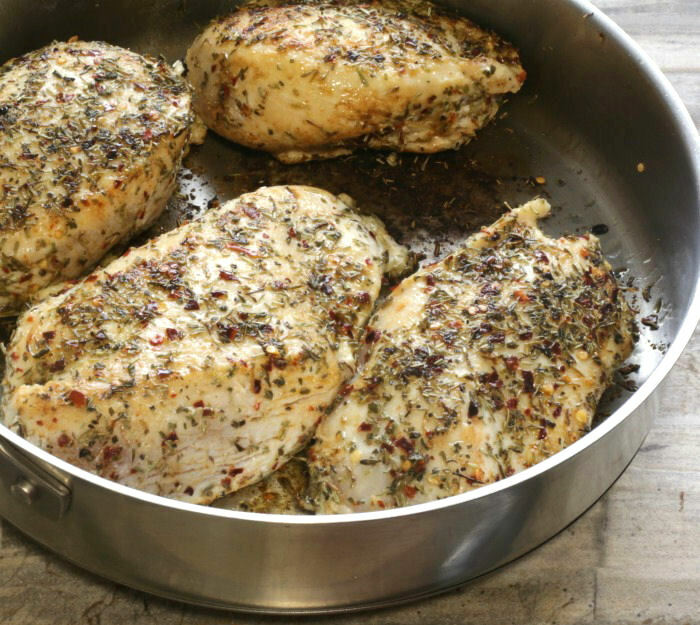 Place the seared chicken in an oven proof baking dish and cook for 25 minutes. Check after 20 minutes. You want the internal temperature is 165 º F. Be careful not to over cook, or you will dry out the chicken. Garnish with some fresh rosemary and oregano and drizzle over a little lemon juice, and serve immediately. Note: You can also make this recipe with bone in breasts with skin. Up the cooking time to about 40 minutes. The bone and skin will make the chicken even more tender but the skin adds extra calories.